Prince Charles inside 'super sewer' Jump to media player Prince Charles visits a sewer in East London to mark the 150th birthday of the city's underground water system. Cameron and Charles in Saudi Arabia Jump to media player World leaders and dignitaries are beginning to arrive in Saudi Arabia to pay their respects following the death of King Abdullah on Friday. Prince Charles visits ancient Saudi site Jump to media player Prince Charles is given rare access to ancient archaeological sites in Saudi Arabia, as he continues his tour of the Middle East. The peculiarity of 'planet Windsor' Jump to media player Author Catherine Mayer talks about her biography of Prince Charles, which Clarence House says is unauthorised. Prince returns to flood-hit Somerset Jump to media player Prince Charles visits Somerset which suffered severe flooding earlier this year. How would the 'super sewer' be built? Jump to media player Planning officials have started looking into proposals to build a so-called "super sewer" under London. Tom Bateman goes into the existing sewers to investigate. 'Bus-sized fatberg' in London sewer Jump to media player Britain's biggest ever "fatberg" has been removed from a London sewer, Thames Water has revealed. 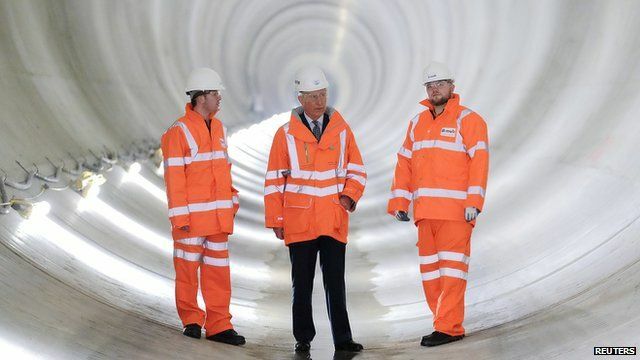 The Prince of Wales has visited a new 'super sewer' in East London. The newly-completed Lee Tunnel is part of a Thames Water project to improve the capital's sewer system. The visit was to mark 150 year anniversary of the capital's sewers which were designed and built by engineer Joseph Bazalgette. The BBC's Nick Higham explains the history of London's sewers.